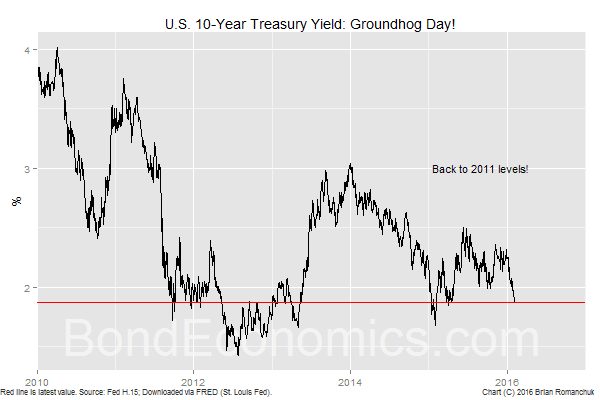 Treasury market participants might be forgiven if they feel that they are trapped in a "Groundhog Day" style time loop; the 10-year Treasury is back at levels seen in 2011. This is despite the widespread belief that a Fed rate hike would cause a bloodbath reminiscent of 1994. Although I have a dour outlook about economic trends, it is still unclear that it is weak enough to trigger a further plunge in yields. The employment-to-population ratio is currently the most reliable component of the Employment Report, and it continued its recent march higher. Admittedly, it is not a perfect indicator of the labour utilisation (part-time versus full-time, etc. 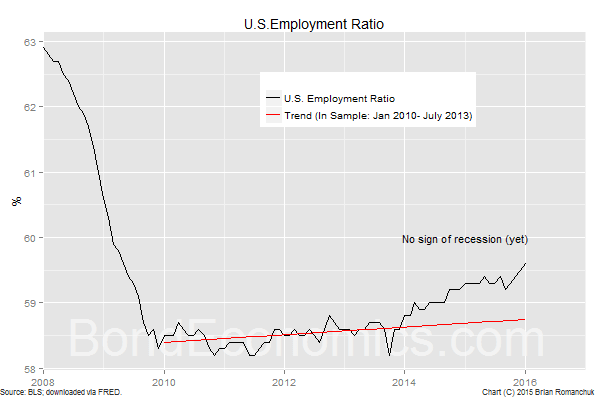 ), but it indicates that the economy is creating slightly more jobs than the growth of the population. The labour market, almost by definition, is a coincident indicator of the economy. One could easily find leading indicators that point to a weakening economy, particularly overseas. That said, we have been in that position for some time, and so far external weakness has not been enough to stop the momentum of the U.S. economy. There is certainly a sectoral recession in place. 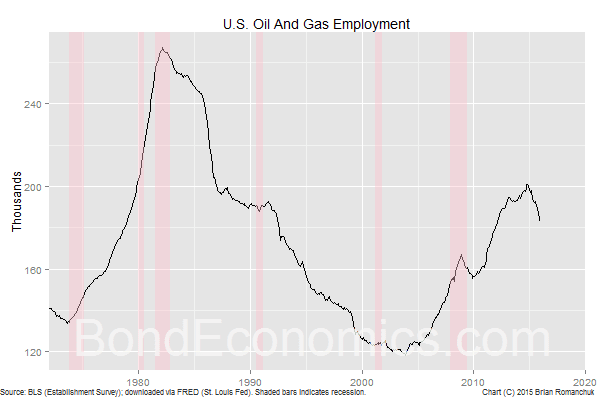 The chart above shows employment in the Oil and Gas industry, based on the Establishment Survey. It is falling, but note the scale. The number of job losses so far was 16,000, which is largely insignificant within the context of the U.S. economy. Yes, those are high-paying jobs, and there is a "multiplier effect" on other sectors like capital goods. Nevertheless, this sectoral recession has been in place for some time, yet the economy is still slowly growing. In fact, Tim Duy assessment is that the "Solid Jobs Report Keeps Fed In Play," which implies that based on the economic data alone, the Fed rate hike in December was not a mistake, and it will be followed up by more hikes this year. It remains to be seen whether the ongoing blood bath in risk assets will finally disrupt the economic data. Although I am bearish on economic prospects, I would note that people calling for a U.S. recession have been trapped in a time loop as well over the past few years.